Most Stratas, whether through the collective help of owners or through the service of a professional, are diligent with snow removal come wintertime. Perhaps the awareness is attributed to the numerous stories of mailman mishaps and the subsequent costs of compensation. 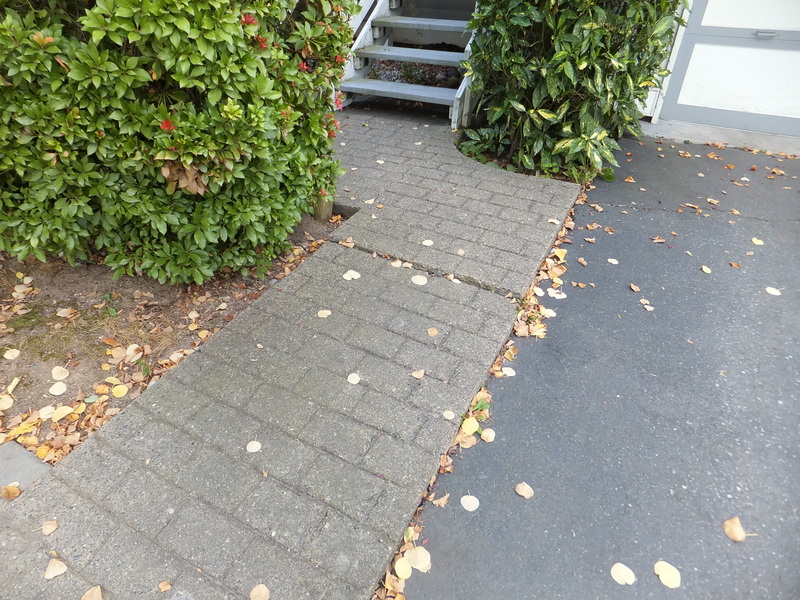 However, there are many other trip hazards around a Strata complex or building that are often overlooked. It is therefore important to locate and understand the potential hazards in order to eliminate them and improve the safety of both the residents and visitors. While snow may cause walkways to be slippery, slime and moss growth can have the same effect. 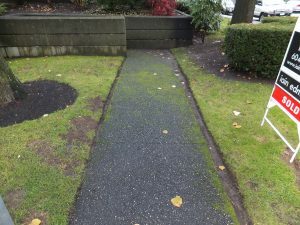 These unwelcomed organic matter tend to accumulate in shaded areas and are both unsightly and dangerous to the user. To clear them, there are many commercial products available on the market; however, there are also household products that are typically effective and often more economical. Included are bleach, vinegar, and ammonia, among others, but these chemicals should be diluted if they are to be used close to soil. Another common and costly issue surrounding walkways is the uplifting effect of trees. In most cases, the walkways are simply planned and installed too closely to the trees. As a tree matures, the trunk and roots gradually flare outwards and damage everything in their paths – they do not just raise the walkways, they may even devour a light post! Generally speaking, when there is an offset of approximately ½ inch, there is a tripping hazard. 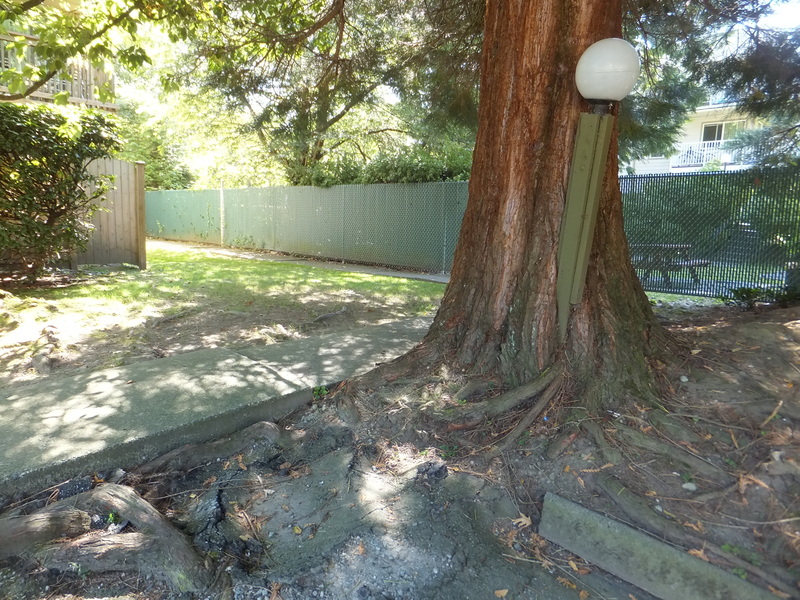 Tree removal or walkway relocation are obvious extreme solutions; however, these are likely not approved due to preservation laws or because they are simply not practical. It is important to seek further guidance from a qualified arborist for the individual case. Though, in most cases, the process will include slabjacking repairs to the walkways or repaving of localized sections to incorporate an acceptable slope while leaving some room to compensate for further growth of the nearby tree. There are tripping concerns associated with staircases as well. The dimensions of the runs, treads, and risers, individually, are generally within the requirements of the building code and deviations are not common. However, the non-uniformity of risers and treads within the same flight of stairs are seen more frequently. The unevenness is generally caused by settlement of the grounds or by poor planning which results in a deeper or shallower step as compensation; this would often cause the unsuspecting pedestrian to stumble and fall. Treads shall have a uniform run with a maximum tolerance of 5mm between adjacent treads, and 10mm between the deepest and shallowest treads in a flight. Required exit stairs shall have riser tolerances similar to those of the treads; otherwise, it shall vary by not more than 1 in 12. 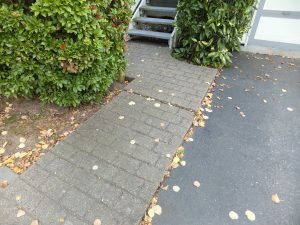 Concrete stairs can generally be fixed through a combination of grinding techniques and a new skim coat layer while wooden stairs can be fixed through re-attachment with the correct spacing. All too often, tripping hazards are left alone until an incident occurs. It is recommended that Strata owners periodically inspect common areas and report any potential hazards to the Strata council. Proactive remedies are generally cheap and quick and would serve to eliminate some potential hazards. These efforts would undoubtedly create a safer environment for all occupants and visitors involved.